I wore this for our flight and first day in DC. I usually go for comfier outfits when I travel, but I knew we were going to be heading out sightseeing as soon as we go to the city, so I wanted to be ready to go. The vest and scarf (yes, I picked up that scarf) were great for staying cozy on the plane, as well as for the hot in the sun, cold in the shade weather DC was having. The sneakers weren't supposed to be a part of this outfit, but when I went to put on my favorite riding boots, the zipper broke off. I was so sad because I've worn them four or five times a week for the past years. On the bright side, I guess that means it's definitely time to pick up a new pair now! And sneakers ended up being a good choice for the day, between walking through the airport, taking public transit, and walking the length of the mall. Linking up with Style Me Wednesday and Style Sessions. My travel outfit is similar- comfy shoes, jeans and a scarf. Although I rarely have the time to travel and now you're making me want to! I'm sorry that your boots broke, but I love that you kept the sneaks! That look is very trendy right now! 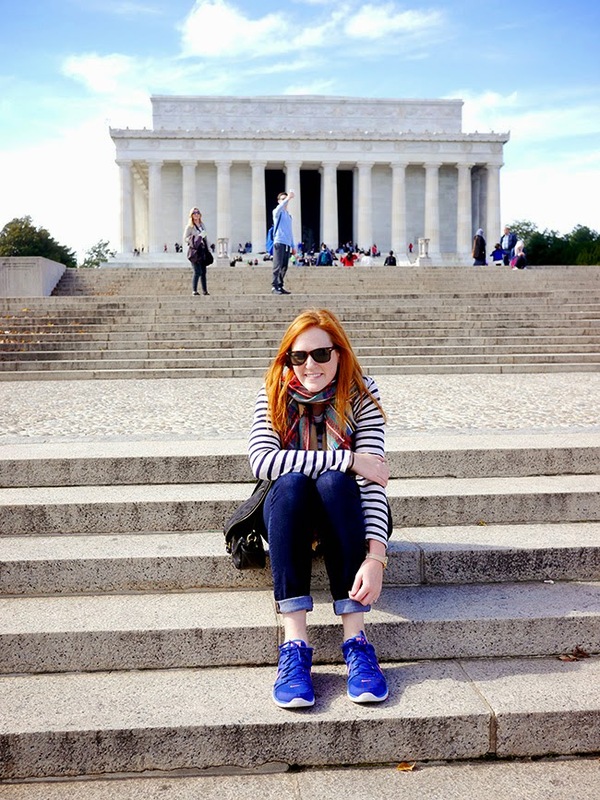 sneakers are a great choice, especially for DC! when I travel I either wear my Kate Spade sparkly Keds, my snakeskin slip on sneaks or my leopard slip on sneaks. I've found that these are an easy way to remain comfy + stylish! Haha I LOVE the name of your blog! :) Plus you are my hero for making sneakers look so chic with this outfit - I am forever trying to make that happen. I'll definitely be back for more! 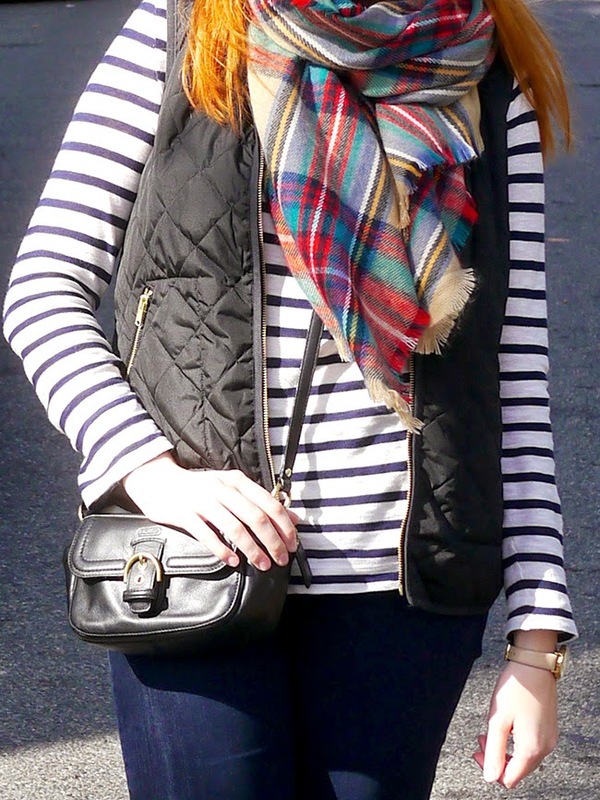 This is such a cute look, I love the combination of plaid and stripes! What a bummer about your boots! 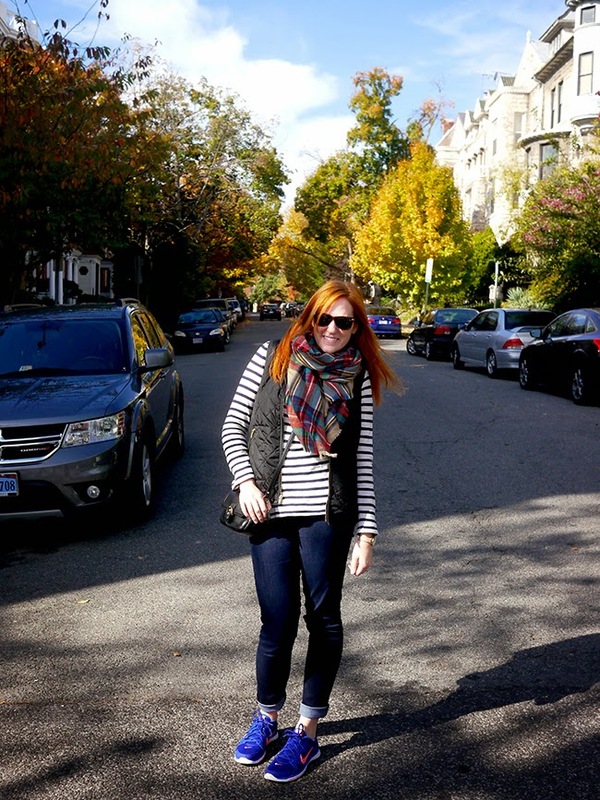 This is a perfect outfit and your sneakers brings out the blues from your scarf. P.S. Hope you stop by Thursday for TBT Fashion link up. I love this outfit!! I wore something similar with my red vest recently, and it's been one of my favorite outfits to date. (Great minds think alike, I see.) Sorry about your boots, but my first thought also would have been "Hey I get to buy new ones!"